Ulrich Peter Ritter died May 27, 2017 at the age of 82 years. We lost a great colleague and friend. On the one hand, he has had – as he always said – a large and big hat size. On the other hand, because of his body size, and third with respect to his marvellous way to gain friends, and this almost everywhere in the world! Ulrich was born in January 29, 1935, and during school time he was very much interested in journalism, and during a one-year scholar exchange in the USA as a high-school news reporter he met Judy whom he married later. Ulrich studied Politics, History, and Economics at the University of Freiburg, at the Institute des Etudes Politiques in Paris as well as at the University of Göttingen, where he got his master degree in Economics. In 1961 he got there his doctoral degree with a thesis about „The role of the State in the early stages of industrialization – the Prussian promotion of industry in the first half of the 19th century“ (published Göttingen 1961). After a one-year stay in Peru, he wrote his second doctoral thesis (habilitation thesis) about „Dwelling structure and economic development – the urbanization as a development-relevant problem in countries of the Third World as exemplified by Latin America“ (published Berlin 1972). While holding a teaching contract and from 1974 on as a representative of a chair at the Johann- Wolfgang-Goethe-University in Frankfurt (Main) he gave a well-taken seminar for tutors and a seminar for professors and scientific asistents. At May 08, 1975, he was appointed Full Professor, and in June 04 of the same year he took the chair of University Didactics of Economics at the Faculty of Economics, Institut of Market and Planning. There is not place enough to review his scientific work with more than 20 books and more than 80 papers. Only two aspects will be taken up. As a professor in University Didactics he gave important and innovative impulses, e. g. with respect to internet-based distance learning and computer-based education and new media. 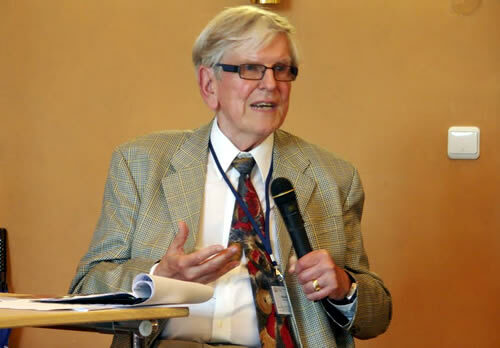 He organized two important international congresses at Goethe University: First the 4th International Congress of the European Association for Research and Development in Higher Education, the Proceedings were published by him and Hans Peter Kühn in 1984. Second, he organized the 25th International IUT Conference in July 2000; the abbreviation IUT stands for Improving University Learning and Teaching! In 1989 he started a lecture series about „Economic Policy in an Ageing Society“. From these lectures a book resulted about „Ageing Policy: a socio-economic perspective“ (written with his assistant Jens Hohmeier and with designs (and comics) by Thomas Plassmann; published by Oldenbourg in München in 1997)! Here he grasped the demographic development; i. e. that the Germans grow older and the population is shrinking with dramatic consequences. This necessitates a policy towards ageing, which must be more than a simple social policy for elderly. The consequences relate to the labor market, the distribution of wealth between „elderly“ and the „young“, securing the amount and quality of social services and much more. In this book three chapters are devoted to „health and securing care (long-term care)“! And he lived his theoretical imaginations: he worked at the North-West hospital in Frankfurt and engaged himself as a „green man“ at the hospital of Bad Soden (Taunus)! Mention must be given also to his endeavours for a comparative economics, published also as a book by Oldenbourg in the second edition 1997. From this also started the Arnoldshain Seminar series, which produced – beginning in 1995 in Arnoldshain/Taunus – an international collaboration between the National University of Corduba (Argentina), the University of Sao Paulo (Brasil) and Goethe-University Frankfurt. This collaboration is since increasing, including now universities from Belgium, the Netherlands, Spain, Uruguay – and Economic University of Vienna (Austria) which was hosting in 2017 the XVth Arnoldshain Seminar. In November 2, 2000 he delivered his „Last Lecture“ (Abschiedsvorlesung) on „Learning by or through mistakes“. But his retirement was always a state of unrest. He was engaged in building a „Seniors' Society“, the so-called „Silberdisteln“ or „Corline thistles“ as a self-help organization in the form of an exchange of services for elderly people. In January 2011 he got the „citizen price“ for all his activities around the Kronberg Castle, Artes Mundi with a lot of remarkable presentations etc. Ritter's activities for the Faculty of Economics and Business Administration, e.g. the Dean's Reception, the revival of the „Inaugural Lccture“, the „Phase of Orientation“ for entering students, the foundation of the Scientific Society of Economists of the Frankfurt University, the „Artus Round Table“, where retired professors meet, the „Hermes Club“, as well as several partnerships with foreign universities, have shaped enduringly the image and culture of the faculty. We all keep him as an honorable reminder.